Inukshuk, left, will be presenting with Hagar Idlout-Sudlovenick, the director of social development for the Qikiqtani Inuit. Aksalnik begins by speaking about QTC’s mandate. It was tasked to make recommendations to promote reconciliation. She speaks specifically about the RCMP dog slaughter on Baffin Island more than 50 years ago. More on that here, from 2011. Inuit were awarded compensation for the slaughter in 2012. She speaks now about the issues with the investigation into the sled dog slaughter. 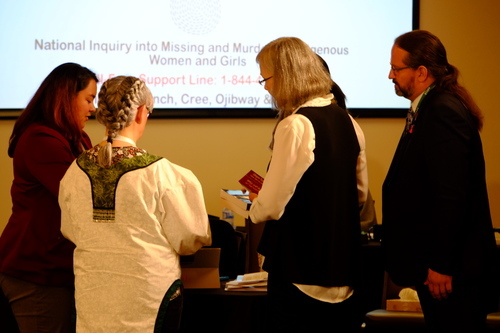 A public inquiry was ordered in the early 2000s, but the federal minister instead asked the RCMP to conduct a full history on the matter and report back. Delivered to the minister and presented to parliament in 2006, the history included no recommendations and instead focused on "bad apples" in the RCMP, she says. Hagar Idlout-Sudlovenick is now speaking about the forced relocation of Inuit people. 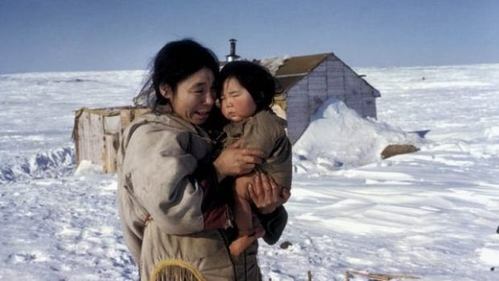 CBCIn the 1950s, 87 Inuit were persuaded by the Canadian government to leave their homes with promises of better hunting and the option to return home if they wanted. The promises were broken, and they were forced to stay in what is now Resolute Bay and Grise Fiord. Aksalnik is now testifying. Idlout-Sudlovenick sits to her right. Aksalnik says that the QTC made 25 recommendations in 4 categories at the end of their testimony gathering. Here's an update on that, from 2016. 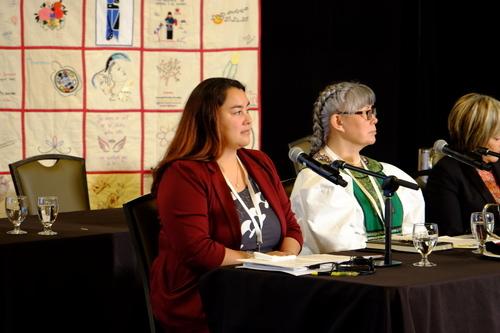 CBCThe Qikiqtani Inuit Association says it's making slow progress on implementing 2013 recommendations from the Qikiqtani Truth Commission, which investigated how the region's Inuit were affected by the era of forced settlement from 1950 to 1975. I'm just realizing that our spotty internet connection means that a lot of my updates are not making it into the blog. Apologies for that - I'll keep an eye out going forward. I want to go back and make sure I include this really powerful testimony from Hagar, on forced relocation of Inuit. “Some had said when they were asked to move to the community, they were told they would have a job, they would be provided with housing and very low rent, and the government would be assisting them. Some of them were told if you move to the community, you will have a house with everything in it, so it’s OK. You can leave your things out at the camp." Hagar and Inukshuk's testimony is concluded. The commissioners are, again, deferring their questions until after cross-examination. The two witnesses are now presenting the final report of the Qikiqtani Truth Commission to the commissioners. The Qikiqtani Truth Commission's final reports have been presented and are officially entered as evidence into the inquiry. We are now adjourned until 1 p.m. ET. When we return, cross examination by the parties with standing will begin. We're getting ready to start back up here with the cross examination phase. 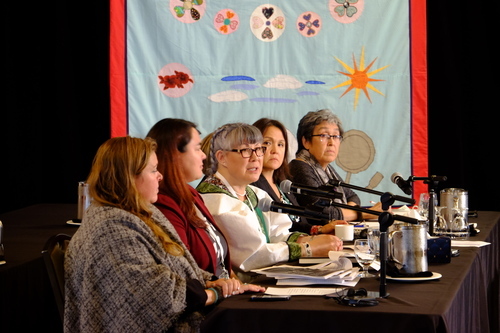 A total of 10 parties with standing will be providing cross examination, beginning with Sarah Beamish on behalf of Independent First Nations. Beamish begins with a question on the lack of understanding on Inuit principles and culture: has the lack of understanding by Qallunaaq resulted in harm? Witnesses immediately answer yes. She then asks if solutions should be rooted in Inuit culture. Idlout-Sudlovenick says that elders need to be consulted on what will work best for their communities. Beamish: We know that Inuit have had to change and adapt their culture. Do you believe that Qallunaaq need to change and adapt their culture? Idlout-Sudlovenick says yes. "We're now in 2018... I think there are processes that are in place to address some of those, but we still have a ways to go." The next question concerns Inuit sled dogs and their relation to Inuit masculinity. Idlout-Sudlovenick agrees with the idea that a tax on these dogs was a tax on Inuit men - removing their utility to the community as hunters and forcing them to buy expensive store-bought food. Beamish asks if these impacts on Inuit masculinity had an impact on violence against Inuit women and girls. "There are so many factors," says Idlout-Sudlovenick, but it "may be contributing to some of it." She's then asked if Inuit masculinity is healing since then, says that it's hard to say. Idlout-Sudlovenick is now speaking about the importance of country food "it's everything that we are." Speaks about the changing landscape of country food - many people have to order caribou meat online because there are hunting restrictions now. Beamish then asks if access to Inuit country food should be considered a right. Idlout-Sudlovenick says that one of the QTC's recommendations is to create healthy communities, and country food is a big part of that. "That is something that is constant... everybody still doesn't have access to country food. Snowmobiles are expensive, boats are expensive. Not everyone has that ability to go out on the land to this day." Beamish is now asking questions to Elisappe Davidee Anigmiuq. She asks about Inuit Qaujimajatuqangit, or traditional knowledge, and if it should be used to guide the recommendations out of this inquiry. 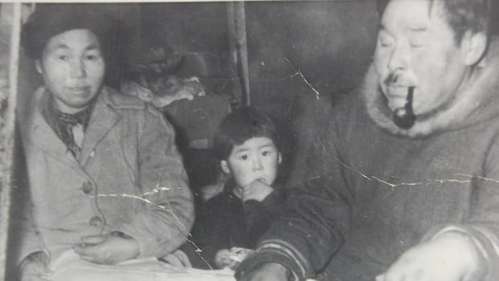 "I think so... Inuit Qaujimajatuqangit provides values for the entire family." Davidee Aningmiuq is asked about the impact of climate change and changes to the environment, and how it's impacted communities. She speaks about polar bears moving into communities and making it dangerous for residents, but also about being told that certain animal populations are decreasing when "we know that's not true... we need to consult the people in the communities." Q: What can Canada do to help nurture fluency in the language? Beamish's time has ended. A representative from Inuit Tapiriit Kanatami is now asking questions of the witnesses. She also stresses the importance of multi-year funding in order to ensure this access. Asked if it's discrimination that Inuit are not given proper access to healthcare in their home communities, Davidee says "I don't know if it's discrimination. I just know it's not there." She talks about the difficulties when being forced to travel for health care, including family separations, leaving children behind, losing culture and their connections to home. "It brings embarrassment, it brings longing... it divides them. Because there's no easy way of coming back home, even if you wanted to come back home. Because the airfares become expensive." Asked if this experience makes Inuit women more vulnerable, Davidee says she can't say that as an expert. When asked how to remedy this lack of services, Davidee points to mental health first and foremost. "There is a big lack of mental health counsellors... of community supports." 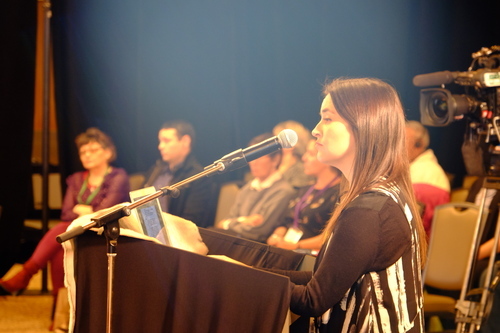 Davidee testifies that there is no Inuktitut-only education available in Nunavut. Asked if access to this education would help address the impacts of federal day schools, she says "absolutely. There's no question about that." "When I go out on the land sometimes there are no words [in English] that describe what we're trying to say out there... it is very important for us to be rooted in our culture, in our language." 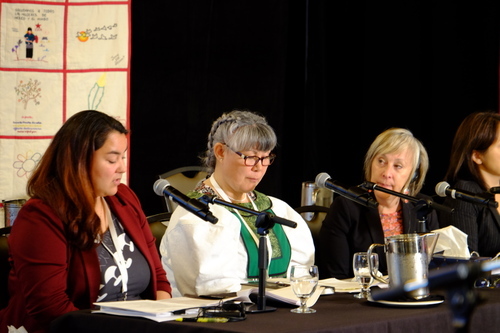 Asked if there are programs where learning Inuit traditional knowledge is accredited in a school, Davidee says she's not sure if these exist, but that it needs to happen. "Let me give you an example. When it comes to our kamik making program, many people say 'this is a PHD education.' There are many things like that in our culture." Questions are now being turned to Aksalnik and Idlout-Sudlovenick, regarding the slaughtering of dogs. Do you think the effects of the dog slaughter have been healed from in communities? "The people that were directly affected by this still feel that it hasn't been addressed," says Idlout-Sudlovenick. "They are still looking for an apology from the government. They want to know how this happened." Says this is a very painful history and re-opens wounds, and an apology would help bring closure. Asked if there is anything that could be done besides an apology to help address the wounds, Idlout-Sodlovenick says it's hard to say. Speaks about QIA looking to provide programming for people directly affected by this to help regain that lost knowledge. "Having a dog team is something you learn over a lifetime. It's not something that you're going to do a 2-hour IQ workshop [and get back]." Next question to Idlout-Sudlovenick is about the historical ideal of being afraid to say no to white government officials. Is that still going on today?